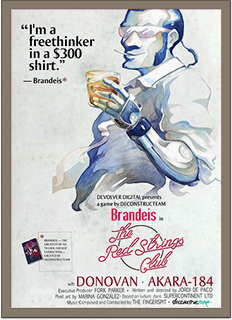 The Red Strings Club is a cyberpunk narrative experience about fate and happiness featuring the extensive use of pottery, bartending andimpersonating people on the phone to take down a corporate conspiracy. Psychological Bartending: Read your customers’ mood and mix the perfect cocktail to manipulate the client's emotions in order to gather the information you want and progress your agenda of stopping Supercontinent's plans. Genetic Implant Pottery: Design genetic implants at a high-techlathe to change the attitude and direction of the corporation’s most influential executives. Vocal Corporate Espionage: Assume the voice of important figures in the Social Psyche Welfare project and play their own motivations against each other over the phone to uncloak their plans. The professed altruistic corporation Supercontinent Ltd is on the verge of releasing Social Psyche Welfare: a system that will eliminate depression, anger and fear from society. However, the bartender of a clandestine club and a freelance hacker don’t regard this evolution as an improvement but as brainwashing. Alongside unwitting company employees and a rogue empathy android, the duo will pull all the strings they can to bring down this scheme. Oh boy, is the Red Strings Club interesting. The Red Strings Club is a vehicle for some of the most engrossing cyberpunk stories I’ve witnessed in recent memory.